Militants led by designated terrorist organisation, Jabhat Al Nusra, now obliquely referred to by the Western media as “Jabhat Fateh al-Sham,” has spearheaded another attempt to disrupt security operations against militants trapped in Syria’s norther city of Aleppo. Despite what is clearly a terrorist assault employing indiscriminate artillery fire provided by Grad rocket systems on an urban center and the use of suicide bombings employing vehicle-borne improvised explosive devices (VBIED), Western media organisations are attempting to depict the assault as a “rebel counter-attack” meant to “break” what it is depicting as a “siege” by Syria’s own military forces. It is particularly interesting to see Reuters attempt to depict the assault as a “rebel” operation, despite being unable to name a single “rebel” group, and admitting the leading role designated foreign terrorist organisation Jabhat Al Nusra is playing as well as the use of clearly terrorist tactics being employed. 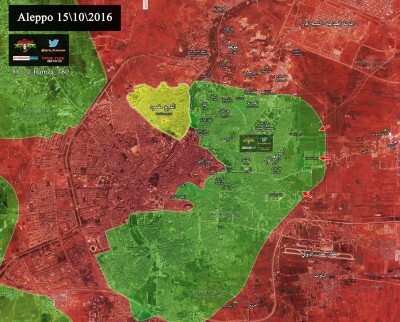 Fateh al-Sham played a big part in a rebel attack in July that managed to break the government siege on eastern Aleppo for several weeks before it was reimposed. Abu Youssef al-Mouhajir, an official from the powerful Ahrar al-Sham Islamist group, said the extent of cooperation between the different rebel factions was unusual, and that the largest axis of attack was on the western edge of the city. Reuters is all but admitting that even the so-called “rebels” it attempts to credit the assault with are operating not under the banner of the “Free Syrian Army,” but ultimately under the banner of Jabhat Al Nusra, quite literally Al Qaeda in Syria. Reuters concedes that this “complicates” US foreign policy in Syria, claiming that heavier weapons cannot be passed on to “rebels” in fear that they would immediately fall into the hands of terrorist groups “rebels” are clearly operating under. Reuters, however, never explains why any weapons at all would be provided to “rebel” groups so clearly and transparently in league with Jabhat Al Nusra in the first place. Grad rockets were launched at Aleppo’s Nairab air base before the assault began said Zakaria Malahiji, head of the political office of the Aleppo-based Fastaqim rebel group, adding that it was going to be “a big battle”. The Observatory also said that Grad surface-to-surface rockets had struck locations around the Hmeimim air base, near Latakia. Grad rockets are an effective weapon in combat on open terrain. In the confined urban environment of Aleppo, they are an indiscriminate weapon the West, its media and its human rights advocates have little trouble pointing out their use constitutes a war crime, but only when used by forces of nations the West seeks to undermine and ultimately overthrow. No mention of their indiscriminate, inappropriate nature when used in urban environments is made when used by forces backed by Western interests. The Aleppo Conquest armed groups may have used chemical weapons, as well as ‘hell cannon’ gas canister munitions. Armed groups surrounding the predominantly Kurdish Sheikh Maqsoud district of Aleppo city have repeatedly carried out indiscriminate attacks – possibly including with chemical weapons – that have struck civilian homes, markets and mosques, killing and injuring civilians, and have displayed a shameful disregard for human life, said Amnesty International today. Indeed, even groups described as “rebels” by the Western media, are guilty of serial offences that clearly make them terrorists, not “rebels.” The fact that this information is omitted from Reuters’ reports and the nature of these groups’ relationship with Al Qaeda affiliates made as intentionally nebulous as possible, reveals a common theme that has run through Western coverage of the Syrian conflict since it began; a concerted effort to conceal the true terroristic nature of so-called “rebels” in a bid to legitimize the illegitimate, and defend the indefensible.